Both of us suffer from the cold (even though Kirsty is supposed to be a ‘hardy’ Scot! ), which certainly has its disadvantages when it comes to skiing. There is so much varying advice to regulate temperature – thick jackets, thin jackets, numerous layering techniques but invariably you nearly always end up carrying a rucksack crammed with spare fleeces and gilets as you can’t get your temperature just right. 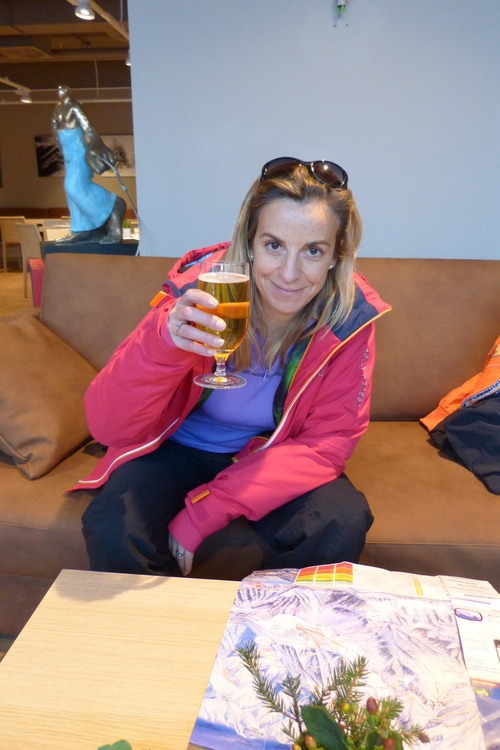 So when we were offered the chance to try out the new Helly Hansen Floria Women’s Jacket (Kirsty) and W Panorama Jacket (Bee) we leapt at the chance – could there really be ski jackets that rise to the challenge of keeping us warm on a hard ski day, early in the season when temperatures are notoriously at their chilliest? 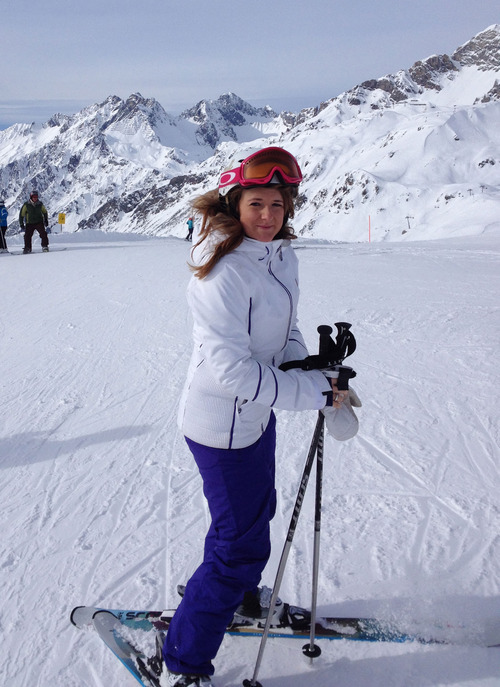 The Floria Women’s ski jacket comes complete with its techie yet rather cosy sounding PrimaLoft Infinity insulation, so I was excited about how that technology may just keep me warm all day. As I unpacked the jacket it wasn’t just the gorgeous vibrant ‘raspberry red’ exterior which caught my eye, it was the funky lining which immediately added a new dimension – instead of just the usual plain colored interior, the lining on this jacket was more akin to the colors I’ve seen in the Northern Lights and immediately, I knew it was going to be different. I had chosen the slopes of Verbier to put this little beauty to the test and as soon as I zipped it up I immediately felt warm. And fit-wise it certainly ticked the box. 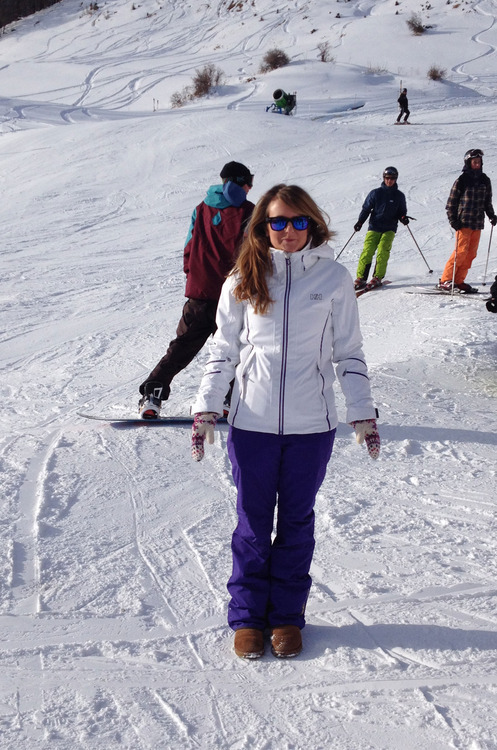 Skiwear often has a propensity not to be terribly flattering and as a female you instantly feel better wearing a jacket that does have a flattering feminine shape. So I was feeling good as I set off to blast round the slopes. First things first, when it came to keeping me warm, it positively excelled itself. My problem is that I generally ski pretty hard and fast so as a result I’m usually pretty warm at the end of a run. Then I cool down whilst I’m sitting on the chairlift and am really pretty chilly by the time I reach the top. And thus this perpetual cycle goes on for most of the day. However, I can honestly say that the Floria jacket was a complete revelation. I was basically zipped into my own self-contained little climate zone thanks to the fully taped seams and the PrimaLoft Infinity insulation. This technology is a system of treated fibres which stops them from absorbing moisture and also keeps them very dry in wet conditions. The PrimaLoft also mimics the softness and compressibility of down and works by trapping more body heat into small airspaces. The bottom line is that your temperature is completely regulated and you stay warm. Genius. Other features of this Helly Hansen jacket worthy of a mention, are the clever ski pass pocket on the sleeve, discreet yet perfectly positioned and the stretchy cuffs with comfortable thumb-loops which anchor the sleeve in place preventing that awful gap you can get between the sleeve and your glove which can provide a sneaky way in for the icy air. The adjustable hood can easily be taken off if required and when I did venture off-piste to perform a rather graceful face plant, the powder skirt stopped the snow from finding its way in where it shouldn’t! Kirsty’s jacket working as well off the slopes as on! 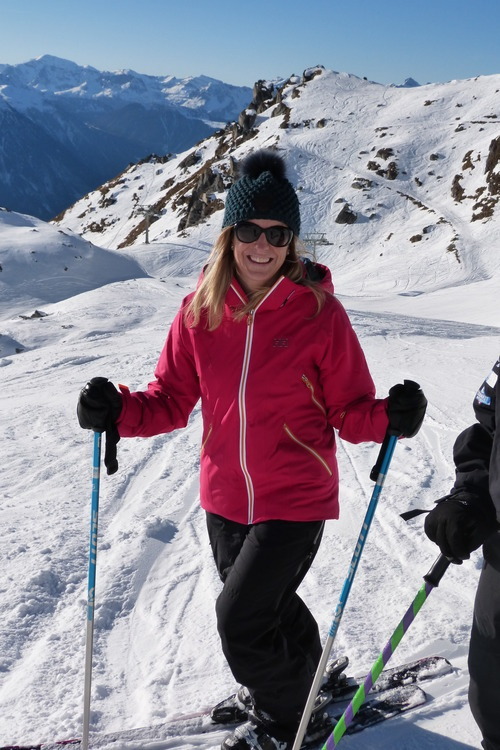 Postscript – Since my trip to Verbier, I have further put this jacket to the test whilst doing some introductory ski touring in Combloux, near Megève. Whilst not specifically designed for this type of skiing, it certainly stood up to the test well and managed to keep me from overheating on the ascent and kept me cosy at the summit whilst removing the skins from my skis. 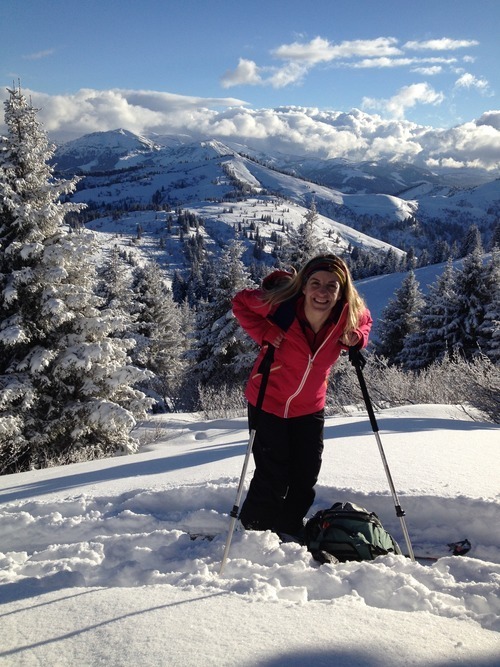 As I bounced through the untracked knee deep powder on the descent, that powder skirt served its purpose well! On that note, the jacket is very fitted – I originally tried a size small (there is also an extra small available and as a size 8 I thought small would be about right – I definitely needed the medium, you need complete freedom to move, twist, turn, flex, bend and jump when skiing – the medium was still really flattering and the arms and length weren’t too long). 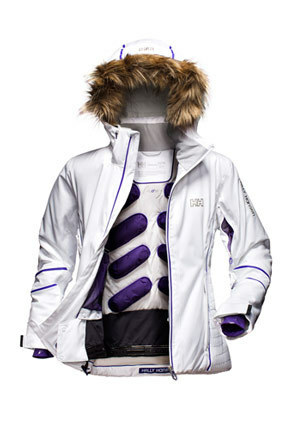 This feminine, fitted, waterproof, breathable and insulated ski jacket keeps the snow out with Helly Tech Performance fabric and your body warm with PrimaLoft insulation. It also uses the unique H2Flow feature, which allows you to control your body’s temperature. The idea of the system is that it can provide heat when needed, but with a high volume of mechanical ventilation, you can get rid of the heat and cool off when you are warmed up. Since heat is trapped in air pockets, the design features little pockets around the jacket. I only wore two light base layer tops underneath and remained toasty warm all day – even once the moon had come up and I was sipping vin chaud on the terrace of an après-ski bar – which at New Year in a high altitude resort is saying something. There are also loads of ski-specific features throughout including a ski-pass pocket, dual hand warming pockets, internal pockets for goggles and electronics, zip-away powder skirt and RECCO Advanced Rescue system. Kate ready to head down the mountain in style!